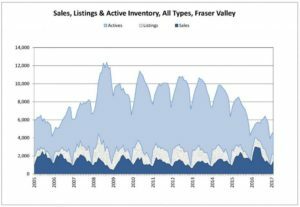 Fraser Valley Real Estate Crash? MLS stats show that February 2017 saw a 41% decline in sales vs February 2016 (1,396 in 2017 vs 2,387 in 2016). Is it time to panic as a seller or the time to celebrate as a buyer? The impact of a significant decline in demand (buyers) is being lessened by an offset in the amount of supply (sellers). February 2016 saw 34% more new listings hit the market than February 2017 (2,171 in 2017 vs 3,283 in 2016). 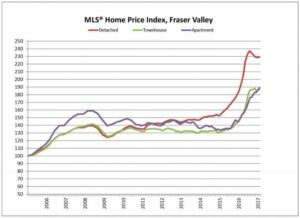 Data for the Fraser Valley shows that prices for all product types (houses, condos & townhouses) remain significantly higher than a year ago. We have seen a small decline in the value of detached homes (houses) while condos and townhouses are stable or inching upwards. As always I caution the reader not to make decisions based entirely on these statistics as they reflect the Fraser Valley in it’s entirety and regional differences are sure to exist. Speak with an expert, someone with experience and knowledge in your region before you jump to false conclusions. I can be reached at 604-857-2857.